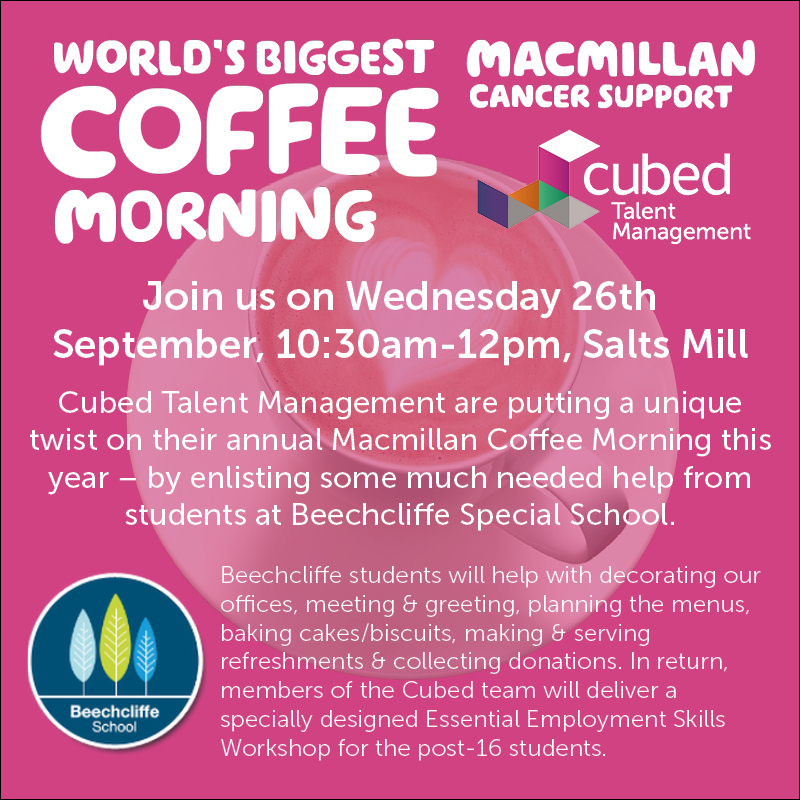 Indigo Healthcare are putting a unique twist on their annual Macmillan Coffee Morning this year – by enlisting some much-needed help from students at Beechcliffe Special School. Whilst it is widely reported that the UK continues to enjoy positive news with new job creation, full employment and record levels of new vacancies reported across most sectors – it is a very different picture for members of our communities with disabilities and additional needs. Disabled people are twice as likely to be unemployed. ‘Life’ on average, costs a disabled person £570 more than able bodied people. The government has committed to supporting 1 million more disabled people into work over the next 10 years. 10 percentage point rise in the employment rate amongst disabled adults would contribute an extra £12 billion to the Exchequer by 2030. Inclusiveness, access to work and equal opportunities for all – are values that underpin us as a nation. Quality work opportunities support the development of skills, knowledge, confidence and help foster a sense of dignity and self-worth. The Macmillan Coffee Morning presented an opportunity for the Beechcliffe students to help support the event by; decorating our offices, meeting and greeting, planning the menus, baking cakes/biscuits, making and serving refreshments, collecting donations. Members of the Indigo team will be delivering a specially designed Essential Employment Skills Workshop helping and advising students with everything from; how to write a CV, understanding and using job boards, interview preparation and role plays. We’re also providing advice and support with understanding wages/salary, tax/NI and the workplace pension. We are inviting guests from Indigo clients, other local businesses, families and our wider communities to join us on the 26th September from 10:30am – to help support the event, raise much needed funds for Macmillan Cancer Care and in doing so, give the students at Beechcliffe the opportunity to learn, participate, contribute and be instrumental in ensuring that this is a successful event for all. For our nation to reach its full potential, every one of its citizens must reach theirs. Being able to harness the skills, talents and contribution of every person should be at the heart of a successful economic plan. But good employment delivers much more than just a strong economy. Good work supports our good health. It keeps us healthy, mentally and physically. It enables us to be economically independent and gives us more choices and opportunities to fulfil our other ambitions in life.